South Korea’s government said Monday that it is keeping close tabs on 21 people who came into close contact with a man who tested positive for Middle East Respiratory Syndrome (MERS). On Saturday, the 61-year-old man was diagnosed with the potentially life threatening disease after returning home from his visit to Kuwait. He was rushed to the emergency room of Samsung Medical Center in southern Seoul upon his arrival at Incheon International Airport. 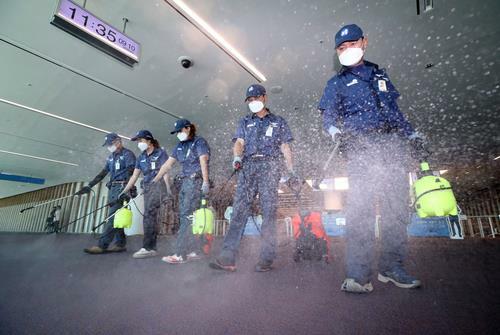 The Korea Centers for Disease Control and Prevention (KCDC) said those on the plane, such as flight attendants, passengers, medical staff and immigration officials, have all been quarantined in their respective homes and are being monitored for signs of MERS. Among them, a 24-year-old British woman who was on the same plane as the MERS patient and showed cold-like symptoms tested negative for the disease. The KCDC initially put the number at 22 but revised it down by one after finding an error in a flight seating system. Those who came within two meters of the MERS patient are considered to have come into close contact. The agency said that 417 people who came into “ordinary” contact with the MERS patient are also being monitored. They have not been quarantined, but they have to report their health condition every day to officials in charge of monitoring. The KCDC at one point raised the number of such people to 452 but later revised it down, saying that some foreigners and flight attendants have left South Korea. However, 50 of 115 foreigners on the “ordinary” contact list are unavailable for contacts with the health authorities. As of Monday, six people, including one flight attendant who had close contact with the MERS patient, have undergone tests. Of them, one person — the British woman — tested negative twice and was discharged from a hospital. Five others are awaiting a second round of tests after testing negative the first time. Meanwhile, a South Korean national who was hospitalized in Kuwait for showing symptoms of MERS has been determined to not have contracted the illness, Seoul’s foreign ministry said. South Korea was hit by an outbreak in 2015 resulting in 38 deaths and 186 people testing positive for MERS.